THE opposition MDC yesterday said it was unfazed by threats and discouragement over today’s street protest while the police warned “some elements are planning to cause violence, disrupt the smooth flow and the peaceful environment”. Addressing journalists at the party headquarters in Harare yesterday, MDC spokesperson Jacob Mafume, who was flanked by party leader Nelson Chamisa, his three deputies and others senior officials, said the demonstration was unstoppable as it was the desire of the suffering masses to register their displeasure at the way the Zanu PF government was running the country. “The demonstration is a people’s demonstration. The people have demanded this demonstration; they have asked us to be able to lead from the front. Not only us, but various sectors of society and those sectors include the churches, students, civil servants, police and army, vendors and farmers will all converge here in Harare,” Mafume said. He said they had notified the police as per provisions of the Constitution, and they are expecting the full co-operation of law enforcers, who will play their part in ensuring the smooth flow of their demonstration. Police spokesperson, Senior Assistant Commissioner Charity Charamba said in a statement that the police had approved the protest, but said they had gathered intelligence reports that some elements would cause violence. “Intelligence at hand indicates that some elements are planning to cause violence, disrupt the smooth flow and peaceful environment in Harare central business district. The Zimbabwe Republic Police is on high alert monitoring the situation to ensure all those who will cause violence are dealt with according to the law,” she said. Mafume said police were bound by the Constitution to protect demonstrators and provide safe passage for anyone who wants to freely express themselves and ensure that provocateurs are stopped in their tracks. “The police are there to ensure that no one interferes with the constitutional rights of Zimbabweans. We are convening a peaceful demonstration. We have complied with the Constitution and we expect all State organs to also comply with the law. We are proceeding in terms of the law and not in any terms of pronouncements by any other person,” he said. MDC national organising secretary, Amos Chibaya claimed the party had foiled a plan by Zanu PF to bus in people from as far as Uzumba and other places to cause disturbances in Harare and lay the blame on the opposition party. “We did receive reports that Zanu PF people are coming from Uzumba and other places. We have since reported the matter to police and I am sure police will handle them because as highlighted, our demonstration will be peaceful and we will not tolerate any violence. If there is anybody who is going to engage in violence, our marshals will do what we call citizens’ arrests,” Chibaya said. 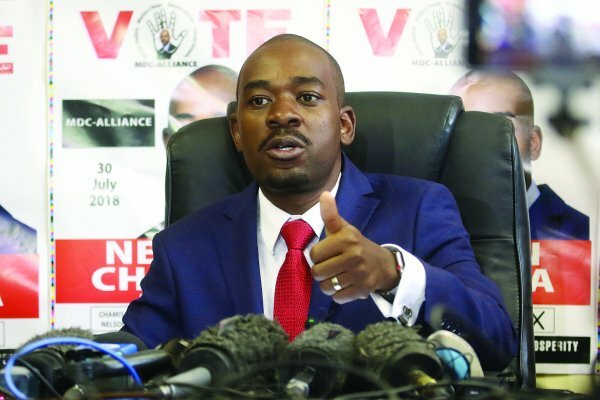 He said they would march from Africa Unity Square, proceed along Jason Moyo Avenue into Leopold Takawira Street; Samora Machel Avenue; Julius Nyerere Way and Nelson Mandela Avenue and end at the Africa Unity Square where Chamisa will address the gathering. The party plans to hand over a petition to Parliament, listing its concerns. Mafume said they would not allow supporters and members to wear party regalia. He said protesters should wear white as a symbol of peace and love. “This demonstration is coming from the people; they need redress and solutions, and they need them now. The form and shape that the solutions will take is up to those who construct the political issues, but what we are clear about is this demonstration is there to express whatever Zimbabweans are feeling,” he said. However, Zanu PF deputy youth secretary Lewis Matutu rubbished claims that the ruling party had sought to infiltrate the MDC protests, saying they had better things to do as a party. “That is ridiculous. Why would we do that?” he asked. “They are saying they are not putting on regalia because they don’t want their people to be identified. There is no peaceful demonstration as they are saying. They believe in chaos. How will they make the country ungovernable through a peaceful demonstration? “They will repeat the same behaviour that they are known for, but for them to then say we are mobilising people to come to Harare is just ridiculous. We don’t have time to mobilise for what they are alleging, we have better things to do to build our country,” he said.